Smart lateral thinking by scientists in Italy and Germany has potentially opened an entirely new field in the study of the structure of proteins. The researchers have described a new technique for rapidly obtaining solid samples of protein for nuclear magnetic resonance interrogation without needing to crystallise the protein. The method, which combines solid-state NMR with ultracentrifugation, could become a versatile way to study transient proteins or to monitor how the structure of proteins changes in the presence of other molecules. 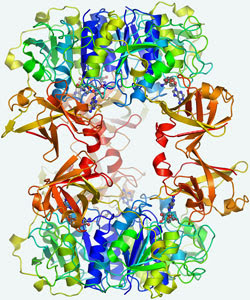 NMR has been used for decades to measure the distance between pairs of nuclei in proteins, which can then be built up into a picture of the molecule's structure. The method is well-suited to soluble proteins - but is limited by the protein's molecular weight. As proteins get above a molecular weight of around 30,000 the signals become almost impossible to interpret. NMR can be used on larger proteins in their crystalline form - solid-state NMR - but obtaining crystals can be difficult and time consuming. Solid state NMR requires the sample to be rotated at high speed in the sample tube, which has the side-effect of producing forces of up to 1 million g. Ivano Bertini and Claudio Luchinat of the University of Florence had a 'lightbulb moment' when they realised that this spinning tube was remarkably similar to an ultracentrifuge - used for almost a century to draw soluble proteins into a solid pellet of sediment. 'We wondered what would happen if we put a soluble protein in the sample tube and spun it - would the protein form a sediment and would this provide an NMR signal?' Luchinat tells Chemistry World. Working with colleagues from Florence and the Technical University of Munich, the researchers experimented with the soluble protein ferritin, which has a molecular weight of 480,000. 'As soon as the sample started spinning we could see a signal of the solid protein as it formed a precipitate on the wall of the cylinder,' Luchinat says. The signal was of the same quality as that from crystalline ferritin. As the spinning stopped, the protein sediment reverted back to solution. The sample tube can also become a reaction vessel: small molecules could be added to the protein and the effect on the structure observed when the sediment is formed. 'It also allows us the possibility to look at species that are transient and difficult to isolate in any other way,' Luchinat suggests.